New Manager, the always popular Eddie Gray, was given his instructions. Get back into the First Division as soon as possible. This was much easier said than done as attendances had sunk dramatically, wages were still unacceptably high and there was a debt reported to be in excess of �5m. Gray trod warily bringing in his friend and former United colleague Jimmy Lumsden as his Assistant and persuaded Syd Owen to return as chief scout. He also started reducing the wage bill and the debt by loaning Peter Barnes to Real Betis for the season, for �0,000, while transferring Welsh International Winger Carl Harris to Charlton Athletic for �0,000. There was no immediate wholesale clearance of the playing staff and although Trevor Cherry, due to suspension, and Kenny Burns, due to injury, missed the opening 1-1 draw at Grimsby Town, United impressed on the pitch. Unfortunately, after being warned due to the incidents at the Hawthorns in the final match of the previous season, the Leeds followers again caused much damage to the Blundell Road ground as trouble flared once again. There were warnings of fines and possible ground closure with disastrous effect on the financially challenged club, by the United Directors to the so called fans. The warning went unheeded and there were clashes with Chelsea fans and a ball-bearing attack on Kevin Keegan and his Newcastle United players. The front page of the Club Programme for the game against Charlton Athletic on 6th November was devoted to spelling out the firm views of the club on the yobs who were putting the club at risk. 揟he future of Leeds United Association Football Club hangs in the balance. This in no way exaggerates the position and must not be taken as an idle threat. Despite repeated pleas and warnings, the mindless actions of a minority of the club抯 so called followers last Saturday have placed an enormous degree of uncertainty over this great club. We know from comments received from in the last few days that many true supporters deplore what took place at the Newcastle game. The FA announced that the terraces had to be closed for the next two home games and that the rest of the stadium was to be all-ticket. The first of these games against Queens Park Rangers saw a ghostly Elland Road and the attendance of 11,528 was the lowest in 19 years. Worse was to follow as the second game against Shrewsbury Town managed to attract only 8,741. There was further trouble at the Baseball Ground and both Derby County and United were found guilty of 慺ailing to exercise proper control over their supporters�. Fortunately, the rest of the season passed without further incident, undoubtedly much to the relief of the club. Events off the field had tended to overshadow those on it, where United had steadily accumulated the points without ever posing a serious promotion threat. They finished 8th with 60 points, in the second season where 3 points were awarded for a win. November saw Frank Worthington sold to Sunderland for �,000, while in March Terry Connor was sold to Brighton for �0,000 with Andy Ritchie making the reverse trip at a cost of �0,000. Skipper and long-time servant, Trevor Cherry joined Bradford City as player-manager for �,000 and later led them back to the Second Division for the first time since 1937.United also pocketed �,000, when Neil Firm joined Peterborough United, while Brian Flynn抯 return to Burnley brought another �,000. Aidan Butterworth was the only United player to register double figures as he lead the goal-scorers with 11. In March John Lukic had asked for a transfer and was promptly dropped, so bringing to an end his record 146 consecutive league games as United custodian. Veteran David Harvey returned to replace him between the sticks and he duly departed for Arsenal for a give-away �0,000 in the summer.Only regulars were Frank Gray 42, Paul Hart, Arthur Graham and Gwyn Thomas with 39, Aidan Butterworth 37 and Martin Dickinson 31. There were several youngsters starting to make their mark. 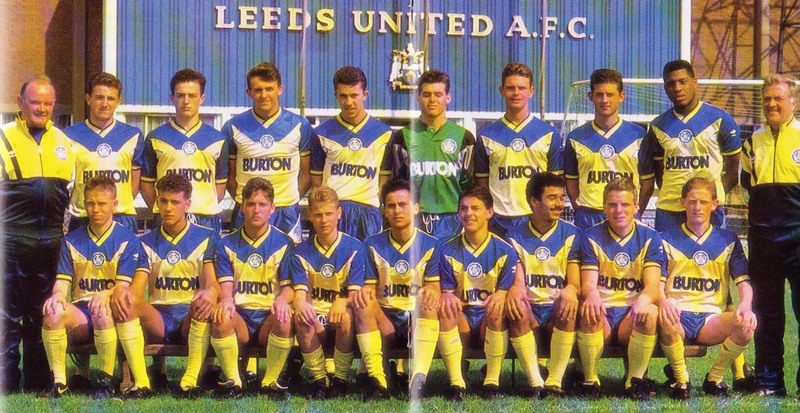 Defender Neil Aspin, Striker Tommy Wright, Winger Mark Gavin, and mid-fielders John Sheridan and Scott Sellars, all teenagers, sampled first-team football. In the FA Cup there was a 3-0 romp at home to Preston North End in the Third Round, followed by an epic 4th Round encounter with Arsenal which saw a 1-1 draw at Highbury, followed by the same score at Elland Road after extra time in the replay, before they were finally beaten in the Second Replay at Highbury 2-1. In the League Cup in the two legged 2nd Round, United lost 1-0 to Newcastle United at St James� before coming through 4-1, after extra-time, at Elland Road in the second leg. Third Division Huddersfield Town won the local derby at Elland Road 1-0 in the Third Round to halt further progress. The close-season saw stalwarts Arthur Graham, who departed to Manchester United for a paltry �,000, and Paul Hart, who joined Nottingham Forest for an equally derisory �,000, leave the club, while Kenny Burns went to Derby County and Brian Greenhoff joined Rochedale, both on free-transfers. Mid-season Derek Parlane was allowed to move to Manchester City for �0,000 and Gwyn Thomas went to Barnsley for �,000. The money was re-invested north of the border, as they paid �1,000 for Celtic striker George McCluskey, �,000 to Aberdeen for midfield ball-winner Andy Watson and �,000 to Dumbarton for their midfielder John Donnelly. They were further strengthened by the return of Peter Barnes from his Spanish sojourn and legendary veteran Peter Lorimer. There was a poor start to the season, when all realistic chance of promotion was lost. Attendances fell and lack of consistency was apparent until an all-time low was reached when United were beaten 1-0 at home in the Second Round of the League Cup by Chester, who were running 92nd out of the 92 Football League clubs, in front of a 8,106 crowd. Total humiliation was averted when United ran out 4-1 victors in the away leg. Third Division Oxford were not as forgiving and after a 1-1 draw at Elland Road in the Third Round, pulverised United 4-1 in the Replay. The FA Cup brought no solace as Allan Clarke抯 Third Division cellar-dwellers Scunthorpe United triumphed in the Third Round. There was a 1-1 draw at Elland Road before a similar result, after extra-time in the replay, took the tie to a second replay which Scunthorpe won 4-2. With no money resulting from the Cups Eddie Gray had to forget thoughts of adding to his young squad as his plans had been dealt a severe blow when talented mid-fielder John Sheridan broke his leg at Barnsley in October. Thoughts of promotion were unthinkable and it was now a fight against relegation. With Peter Lorimer pulling the strings in midfield, United slowly pulled the season round losing only four games in the New Year and they rose up the league to finish a creditable tenth with 60 points as Eddie Gray finally hung up his boots after the last game against Charlton Athletic. Despite severe injuries he had amassed over 550 games for United and, like his 12 Scottish Caps, would have been substantially increased but for those mid-career injuries. Eddie, together with Peter Lorimer, who had now broken John Charles� aggregate League goals record, had done well to foster the fledgling youngsters. By season抯 end Denis Irwin had established himself at right-back, as had Neil Aspin, in central defence, Scott Sellars, in left-midfield and Tommy Wright as striker. With the talented John Sheridan recovering from his injury, and the hooligan element seemingly in check, the campaign could be considered a success and boded well for the new season. With money in short supply, giant centre-half Andy Linighan who was bought for �,000 from Hartlepool United, was the only close season acquisition but John Stiles, Terry Phelan, Peter Swan and Lyndon Simmonds had signed professional forms. There was further cost cutting as Coach Barry Murphy and chief scout Syd Owen both departed and Peter Barnes departed to Coventry City for �,000. Hopes were high as the first four games were won as United shot to the top of the league, but were deflated as the next three games brought consecutive defeats. While the goals flowed the inconsistency lasted the whole season as they blew hot and cold to remain on the fringes of promotion. There was bright attacking football which produced some fine wins but on other occasions the youngsters were often out-muscled. Manager Gray did try to beef up his team and the bustling Ian Baird was recruited from Southampton for �,000 in March, which brought a shake-up as Andy Watson was sold to Heart of Midlothian for �,000 and John Donnelly joined Partick Thistle for �,000 after a loan period. There was a change also in goal where Mervyn Day was bought from Aston Villa for �,000 and this meant that the popular David Harvey who had passed the 350 mark in appearances was freed to Bradford City and Tony Brown was also freed to Doncaster Rovers. The robust Baird soon made his presence felt scoring 6 goals in his first 9 games and United went into the final game at the already promoted Birmingham City still clinging on to the mathematically possible promotion. It was to be a sad day for Football and Leeds United. There was the dual tragedy of the Bradford City fire disaster which claimed 56 lives, while the game at St Andrews resulted in crowd trouble and a boy died. After Birmingham scored the only goal of the game in the first half, a group of Leeds supporters invaded the pitch and there were skirmishes with their Birmingham counterparts who had also flooded onto the playing area. The teams were taken off and mounted police were called in to quell the riot and clear the field. The game was duly completed, albeit after a 30 minute delay, under an uneasy atmosphere and as the game finished and the fans departed a wall collapsed under their weight and crushed a teenage boy. It was a truly sad day for Football. 96 police were among the injured during the 態attle of St Andrews� 110 appeared before the Birmingham magistrates the following week and the twin tragedies were followed by the Heysel Stadium tragedy where Liverpool and Juventus fans clashed resulting in 38 fans being killed and over 400 injured. It was back to square one for United in their battle against hooliganism, which seemed to have been quelled in a relatively trouble-free previous season and until trouble was reported at Oxford, Huddersfield and Barnsley before the violent climax at Birmingham put the future of the club at risk once more. In the League Cup United had won both their Second Round ties against Gillingham before a visit before a visit from Watford, who had been Division One Runners-up in 1982-83, saw a 4-0 home defeat. The FA Cup brought a 2-0 home defeat by Everton, in the Third Round. With John Sheridan and Andy Linighan ever-present, Denis Irwin and Tommy Wright only absent once, Peter Lorimer twice, and Scott Sellars and Frank Gray three times. The team was starting to become well-established particularly as Aspin and Hamson also played over 30 games and Harvey and Day had shared the keeping duties and Ritchie and Baird the centre-forward spot. Tommy Wright had top-scored with 14, while Andy Ritchie contributed 12. Unfortunately, rather than the talk of the exciting young talent and the teams achievements it was more about the Leeds United thugs who blighted their support. 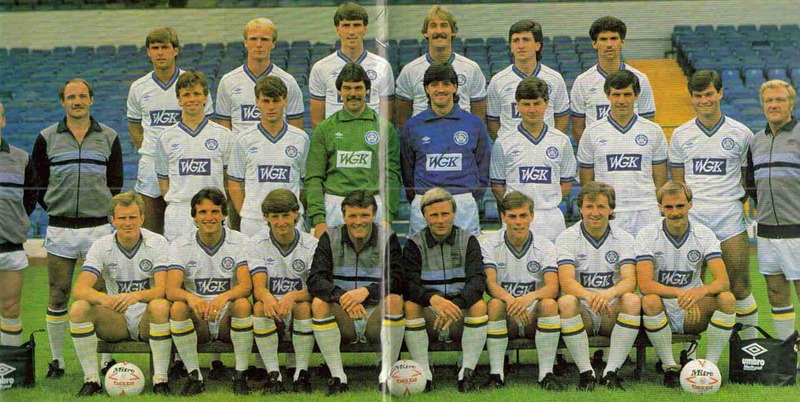 These were times when it was hard for Leeds fans to lift their heads up high. United were duly punished with a �000 fine for their part in the St Andrews debacle, and their away fixtures for the season were made all-ticket. It was not entirely successful but soon troubles on the pitch were to overshadow them. In his preparation for the new season Manager Eddie Gray had to let his brother Frank depart to Sunderland for a much needed �0,000, but worse was to follow as the team failed to win any of their first five games. A run of eight games brought only one defeat and it seemed the storm had been weathered, but, just after a 3-0 win at Walsall had ensured progress to Round Three of the League Cup, Gray and his assistant Jimmy Lumsden were sacked on a split decision by the board. The players were devastated and Peter Lorimer gave the Board a statement condemning the handling and timing of the decision but pledged to continue to their best for the club and backed this up by winning the next game 1-0 at home to Middlesbrough, where the fans chanted for the re-instatement of Gray and the resignation of the Chairman. Coach Peter Gunby was put in charge but despite paying tribute to Eddie Gray抯 22 years of service the directors said that 14th in Division Two was not good enough for a club of United抯 stature. It was quite surprising, really, as Don Revie had a far worse record in his early tenure as Manager! One Leeds Legend replaced another as Billy Bremner left Doncaster Rovers to become the third consecutive former player to be appointed Manager. The close season had seen Ian Snodin signed for �0,000 from Bremner抯 former club and he wasted no time in appointing him Captain at the expense of Peter Lorimer, who was released. Lorimer had made a massive contribution to Leeds United and in his two spells had made 677 starts and 28 substitute appearances scoring a club record 268 goals of which 168 were in the league. 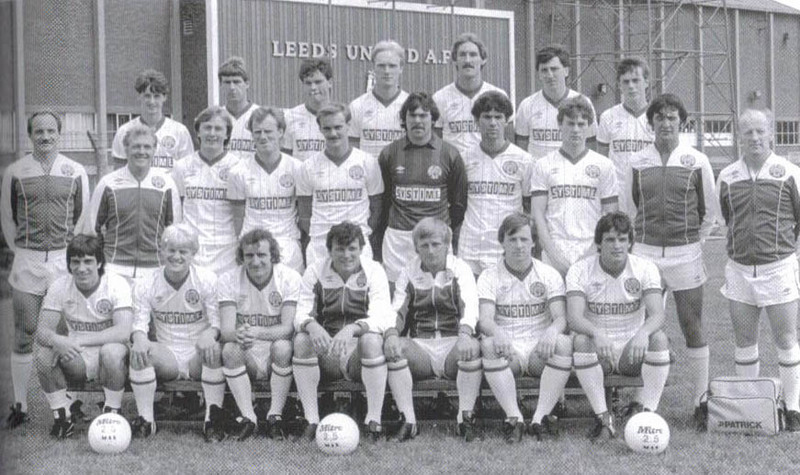 These were hard times financially and Elland Road was sold to the Leeds City Council for �5 million in exchange for a 125 year lease and the vision of an improved stadium and the development of the surrounding area into a sporting complex. Bremner sold Andy Linighan to Oldham for a mere �,000, chickenfeed when one considers the millions his future transfers would bring, while Martin Dickinson went to West Bromwich Albion for �,000. They were replaced by Brendan Ormsby, from Aston Villa for �,000 and David Rennie, from Leicester City for a further �,000, who formed the new central defensive partnership. Ronnie Robinson joined on a free from Ipswich Town, and he went back to his former club to bring in Brian Caswell, for �,000, and David Harle for �000. There were debuts too for John Stiles, Peter Swan and Bob Taylor from the United Junior ranks, but several Eddie Gray discoveries such as Denis Irwin, Tommy Wright, Terry Phelan and Scott Sellars were overlooked. The hooligan element re-appeared, as there was trouble at The Den in November and the FA made all Millwall games all-ticket and banned all Leeds fans from their away games. The implementation of this ban proved impossible and after several hundred fans attended the ensuing two away games at Carlisle and Wimbledon, the FA rescinded the ban but all away games remained all-ticket. The advent of Bremner had not shown any major improvement in United抯 fortunes and they duly exited the League Cup in the Third Round 3-0 at home to Aston Villa and were ousted from the FA Cup in the Third Round, by 1-0 away to 4th Division strugglers Peterborough United. The new Full-Members Cup saw another quick demise as they lost at Manchester City 6-1 and drew 1-1 at home to Sheffield United. In the League United struggled to 14th with 53 points with Ian Baird leading the goal-scorers with 12, while Andy Ritchie managed 11. Bremner rang the changes in preparation for his first full season in charge. 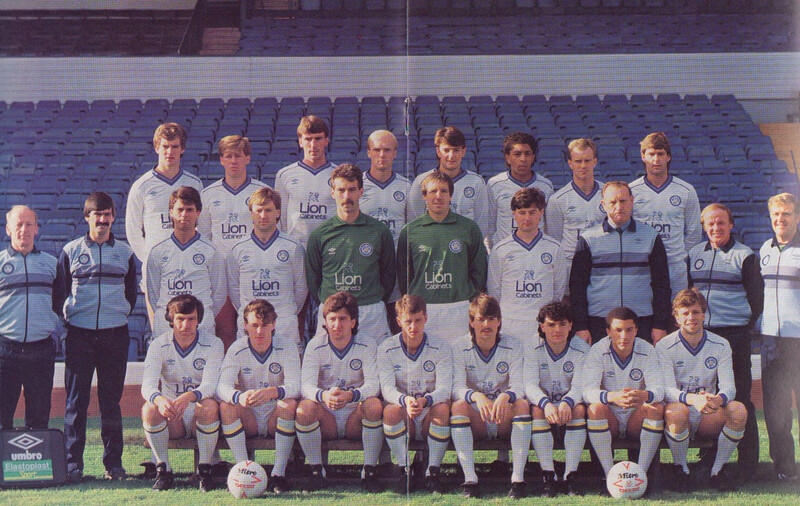 Out went many of the young players groomed by Eddie Gray. Denis Irwin moved to Oldham Athletic for �,000, and went on to win many Irish Caps and honours with Manchester United, in a long and illustrious career. He was soon joined there by Tommy Wright, for �,000 while Scott Sellars brought �,000 when he moved to Blackburn Rovers. Scott later had a second spell at Leeds when his return cost �0,000! Terry Phelan was allowed to leave on a free to Swansea City, a truly poor piece of business as his future transfers were in the � millions. Also departing was George McCluskey, to Hibernian, and Gary Hamson, to Bristol City, both on frees, while �,000 was received for David Harle, who also joined Bristol City. There were almost as many players coming in. Prolific scorer Keith Edwards cost �5,000 from Sheffield United, Newcastle United defender Peter Haddock cost �,000, experienced defender Jack Ashurst was signed from Carlisle United for �,000 and Bremner returned to his old club, Doncaster Rovers to pick up Winger John Buckley for �,000. Keeper Ronnie Sinclair cost �,000 from Nottingham Forest, while Right-Winger Russell Doig cost �,000 when joining from East Stirlingshire. The season was only seven games old when the lunatic fringe reared their heads once more. The FA, noting an improved behaviour, had lifted the away all-ticket ban for the short trip to Bradford City, but in the game, which was played at the unsegregated Odsal Stadium gave the hooligans licence to roam and fights broke out between the rival supporters. A fish and chip van was overturned and set alight. The game was held up for 20 minutes until the ground was emptied and the game was finished in front of an empty stadium. In order to stamp out the hooliganism United requested that the all-ticket restrictions be re-introduced and the FA concurred. Genuine supporters were pleased with United抯 good start to the season and November saw them handily placed behind Portsmouth and Oldham Athletic, looking well placed for promotion. But they slipped badly in the following weeks and a 7-2 defeat at Stoke City had the alarm bells ringing. Bremner reacted by selling his much sought after Captain Ian Snodin to Everton for a club record �0,000. 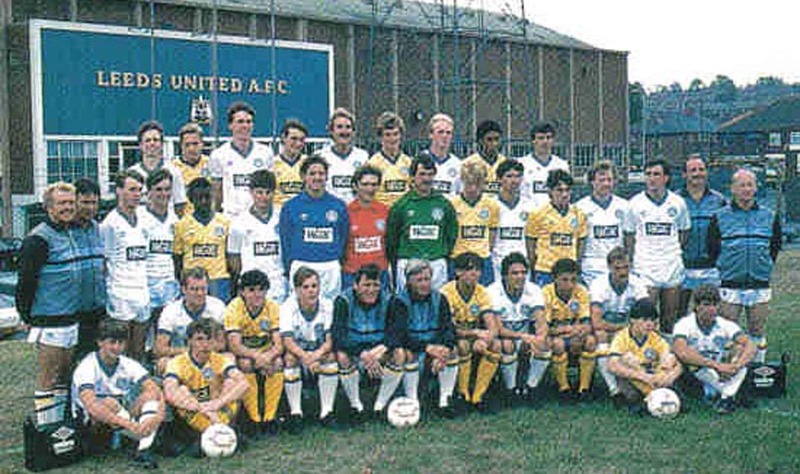 The money was spent on team strengthening with Winger/Full-back Mickey Adams costing �0,000 from Coventry City, experienced Full-Back Bobby McDonald �,000 from Oxford United, while he went to Charlton Athletic and paid �0,000 for Welsh International Midfielder Mark Aizlewood and �,000 for beanpole striker John Pearson. It was a big risk to take in mid-season but gradually the gap was closed on the leading pack as United sought direct promotion or at worst a play-off position. The team took on a settled look of Day; Aspin, McDonald; Aizlewood, Ashurst, Ormsby; Ritchie/Stiles, Sheridan, Pearson, Baird and Adams with Edwards and Rennie in reserve. The League Cup had brought a 2nd Round exit, beaten in both legs by Oldham Athletic, while the Full-Members Cup saw a 1-0 home defeat, after extra-time to Bradford City in the First Round. So there were no great expectations, but possible trepidation, in the FA Cup when Non-League Telford United was drawn for the Third Round. The tie was switched to the nearby Hawthorns as there was fear that their home ground could not cope with the dreaded influx of the Leeds fans. Two goals from the in-form Ian Baird saw Leeds through, in front of unrivalled police security. There was a 2-1 Mervyn Day-inspired win at Third Division Swindon Town in the 4th Round, which set up a meeting with First Division Queens Park Rangers at Elland Road. Thousands were locked out as a Brendan Ormsby header gave Leeds victory and an away tie with Third Division Wigan Athletic. On a windswept pitch Mervyn Day was again in form and was United抯 saviour on more than one occasion before long-range goals from Mickey Adams and John Stiles gave United a 2-0 victory and a place in the Semi-Finals for the first time in ten years. A sun-drenched Hillsborough was the venue, and a David Rennie header gave United an early lead. Coventry City could not breach the United抯 defence until Brendan Ormsby elected not to thump the ball into the crowd and was dispossessed by Dave Bennett who crossed for Micky Gynn to get the equaliser. Minutes later Keith Houchen gave Coventry the lead, but Keith Edwards came off the bench to head a late equaliser and send the game into extra-time. United gave their all, but Bennett scored the winner in the extra stanza and Leeds won many friends by their display and more importantly there was no misbehaviour from their followers. John Sheridan and Ian Baird led the League scorers with 15 each and they together with Neil Aspin and Jack Ashurst were the regulars all topping 40 League appearances. United won five and drew one of their remaining eight fixtures, finishing 4th on 68 points, which was sufficient for them to join 3rd placed Oldham Athletic, 5th placed Ipswich Town and 19th placed First Division Club, Charlton Athletic in the play-offs. This was the season when the First Division was reduced by one club to a 21 team competition for the following season when the division would again be reduced to bring it to its present day 20 clubs. United had finished seven points behind Oldham Athletic, who had looked like direct promotion candidates for much of the season. United had twice lost to them in the League Cup and also at 2-0 at Elland Road, but an Andy Ritchie goal had seen them win at Boundary Park. So with Ipswich Town and Charlton Athletic contesting the other half of the play off, United started second favourites to advance further. Oldham Athletic included Andy Linighan, Denis Irwin and Tommy Wright, all Bremner rejects, and there were some desperate moments before Keith Edwards came off the bench to give United a late winner at Elland Road. In the return leg, Gary Williams soon gave Oldham the lead on their home soil. It looked all over for United as Mike Cecere gave Oldham the aggregate lead with a few minutes to go, but super-sub Keith Edwards levelled the aggregate score straight from the kick-off and United hung on in desperation to keep extra-time scoreless and United were through on the away rule and advanced to meet Charlton Athletic who had eliminated Ipswich Town. Once more tension and late goals kept the fans on the edge of their seats. A dour game at the Valley had seen a Jim Melrose goal give Charlton Athletic a 1-0 victory. A white-hot Elland Road greeted the teams and Brendan Ormsby got the final touch to a Bob Taylor shot as United levelled the aggregate score 1-0. The final game of a long hard season took place at St Andrews Birmingham, the neutral venue for the final deciding play-off. The game was 0-0 at the end of ordinary time, but John Sheridan, who had had a superb season, gave United the lead in the first-half of extra time with a curling free-kick. Unfortunately, United, who had lost defensive lynchpin Brendan Ormsby injured in normal time, could not hang on and Peter Shirtliff scored twice in the final minutes. It was a sad end to a remarkable season which saw United literally minutes from both Wembley and promotion. Echoes of past glories had been awoken and Billy Bremner was given an extended contract to lead United back to the First Division. After their previous years exploits United were firmly installed as promotion favourites by the bookies, in a season which saw multiple tactical substitutions allowed for the first time. Bremner went into the market and bought Full-Back/Midfielder Glynn Snodin, brother of former skipper Ian, from Sheffield Wednesday for �0,000 and Aston Villa抯 Full-Back Gary Williams for �0,000, but surprisingly allowed chief strikers Ian Baird, to leave for promoted Portsmouth for �5,000, and Andy Ritchie, who joined the ever growing band of ex-Leeds players at Oldham Athletic fora give-away �,000. Brendan Ormsby was ruled out for the season with cartilage trouble and Mark Aizlewood took over his skipper抯 armband. United were off to a dismal start, with only single John Sheridan-scored goal victories over Leicester City and West Bromwich Albion in their first nine games, in which only three goals were scored. It was therefore, surprising when Keith Edwards departed for Aberdeen for a mere �,000. Jim Melrose arrived from Charlton Athletic for �,000 but was not a success and after only three full games departed to Shrewsbury Town for a similar amount later in the season. There was a similar happening as midfielder Ken De Mange arrived from Liverpool for �,000 to disappear to Hull City for the same amount, after only slightly more than a dozen appearances. Billy Bremner tried to solve his lack of goals by switching reserve defender Peter Swan to a striking role, which worked temporarily but it wasn抰 until Bobby Davison was bought from Derby County for �0,000 that the problem was solved. The League Cup saw a 1-1 home draw against Third Division relegation contenders York City before a 4-0 away victory carried them through to the Third Round and yet another meeting with old adversaries Oldham Athletic. 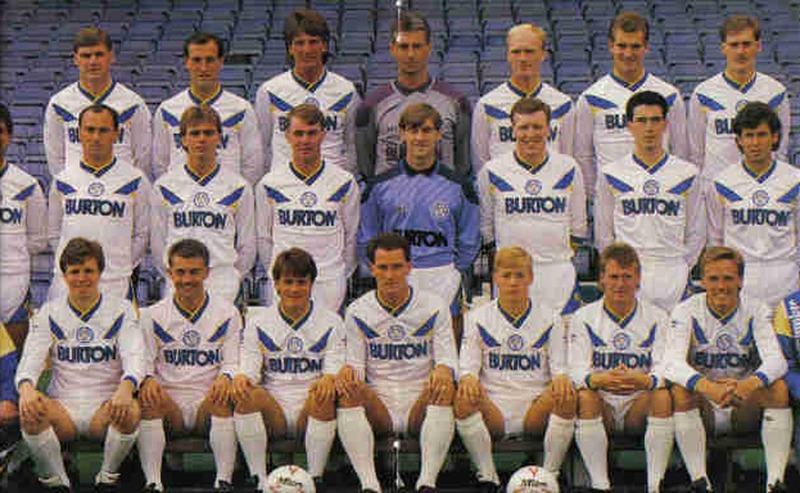 After a 2-2 draw at Elland Road, they were beaten 4-2 at Boundary Park, in the replay. The Full-Members Cup had been renamed the Simod Cup but it brought no change of fortune as although they beat lowly Sheffield United 3-0 in the First Round, a trip to The Den saw a 2-0 defeat at the hands of Millwall. Aston Villa was 2-1 victors at Elland Road to stop United抯 progress in the Third Round of the FA Cup. United put together a fine run of five wins in December and the visit of local rivals and promotion aspirants Bradford City on New Years� Day saw an unusually high attendance of 36,004 witness a fine 2-0 United victory . Just when the sleeping giant seemed ready to reawaken, United fell into a deep sleep and lost contact with the leading pack. Not even the return of Ian Baird from Portsmouth for a bargain �0,000 could get United back into the promotion race and the season fizzled to a disappointing end with United 7th on 69 points, with midfielder John Sheridan leading the marksmen with a dozen.. It had been a season of anti-climax, with many of Bremner抯 signings big disappointments, but it did see the emergence of several youngsters, with one shining brightest of all, a man caste in the Billy Bremner mould, Leeds-born David Batty. Despite the feeling of anti-climax at the end of the previous season, the supporters showed their faith and season ticket sales for the new season hit the �0,000 mark. Billy Bremner raided impoverished newly relegated Portsmouth. As Brendan Ormsby was struggling to find full-fitness he pounced to take Centre-Half Noel Blake on a free, while he put in a �,000 bid for Vince Hilaire, the former Crystal Palace, England 態� and under-21 International, who Portsmouth valued at �0,000. The fee went to a tribunal and was settled at �0,000. Coincidentally, United抯 first away game was at Portsmouth and the ex-Portsmouth trio, of the aforementioned and Ian Baird, made an unhappy return to Fratton Park as their new team was on the end of a 4-0 thrashing and to make Ian Baird抯 return even the more miserable, he was sent off. 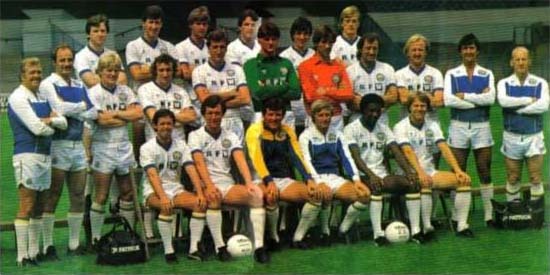 Only one game was won from the first six league games and despite a 2-1 win at Peterborough United in the first leg of the Second Round of the League Cup and Billy Bremner and his Dave Bentley and chief scout Dave Blakey were axed, leaving coach Peter Gunby in temporary charge pending the appointment of a new Manager. Bremner had not been able to fulfil the promise shown in 1986-87 but had restored some pride into the sleeping giant. It now remained for the right person to take the club back to its place among the elite. The man proved to be someone close to home. Howard Wilkinson, Manager of Yorkshire neighbours Sheffield Wednesday. Middle Row: Peter Gunby (Coach), Keith Mincher (Coach), Aidan Butterworth, Kevin Hird, Paul Hart, John Lukic, David Seaman, Frank Worthington, Kenny Burns, Barry Murphy (Coach), Geoff Ladley (Physio). Front Row: Brian Flynn, Trevor Cherry, Eddie Gray (Player-Manager), Jimmy Lumsden (Assistant Manager), Terry Connor, Arthur Graham. Middle Row: Aidan Butterworth, Kevin Hird, Paul Hart, John Lukic, David Seaman, Frank Worthington, Kenny Burns. 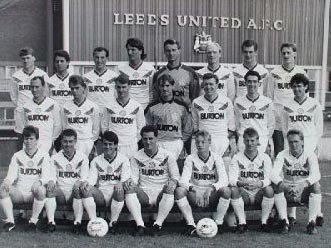 Back Row: Mark Gavin, Martin Dickinson, Neil Aspin, John Lukic, Paul Hart, David Harvey, Gary Hamson, John Donnelly, Kevin Hird. Front Row:Gwyn Thomas, Aidan Butterworth, John Sheridan, Andy Ritchie, Eddie Gray (Player-Manager), Tommy Wright, Arthur Graham, Frank Gray. Back Row: Norman Fry, Neil Aspin, Tony Sharkey, Steven Atkinson, Keith Mincher (Coach). 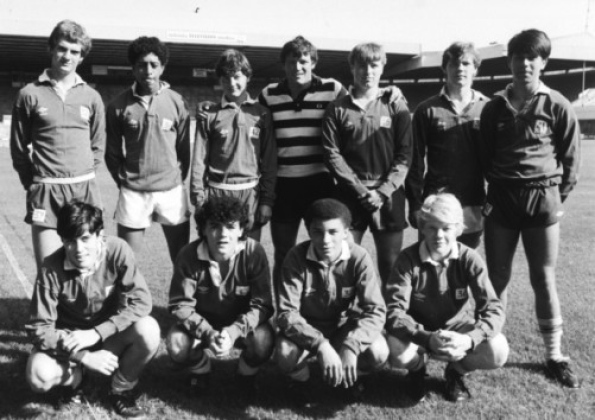 Back Row: Keith Mincher (Coach), Dennis Irwin, Darrel Rose, Tommy Wright, Wayne Roebuck, Nigel Thompson. Front Row: Scott Sellars, Mark Mantell, Keith Manning, Roger Eli, Steven Atkinson, Steven Livingstone. Back Row: Jack Roberts (Trainer), Mark Mantell, Roger Eli, Tim Taylor, Tony Fawthrop (Scout), Darrel Rose, Syd Owen (Senior Coach), Keith Manning, Scott Sellars, Peter Swan, Keith Mincher (Coach). Front Row: Tommy Wright, Steven Atkinson, Wayne Roebuck, Dennis Irwin, Nigel Thompson, Stephen Scholes, Steven Livingstone. Back Row: Barry Murphy (Coach), Norman Fry, Tony Sharkey, Terry Phelan, Neil Aspin, Darrel Rose, Wayne Roebuck, Lyndon Simmonds. Front Row: Mark Russell, Dennis Irwin, Mark Gavin, Tommy Wright, Nigel Thompson, Roger Eli. 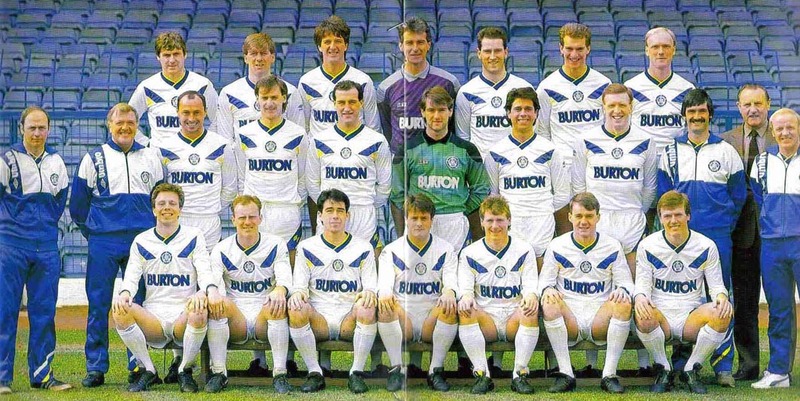 Back Row: Scott Sellars, Martin Dickinson, Mark Gavin, Neil Aspin, Tony Brown, George McCluskey, Tommy Wright. Middle Row: Keith Mincher (Coach), Peter Gunby (Coach), Peter Barnes, Andy Ritchie, Andy Watson, David Harvey, John Donnelly, John Sheridan, Barry Murphy (Coach), Geoff Ladley (Physio). Front Row: Gwyn Thomas, Aidan Butterworth, Kevin Hird, Eddie Gray (Player-Manager), Jimmy Lumsden (Assistant Manager), Gary Hamson, Frank Gray. 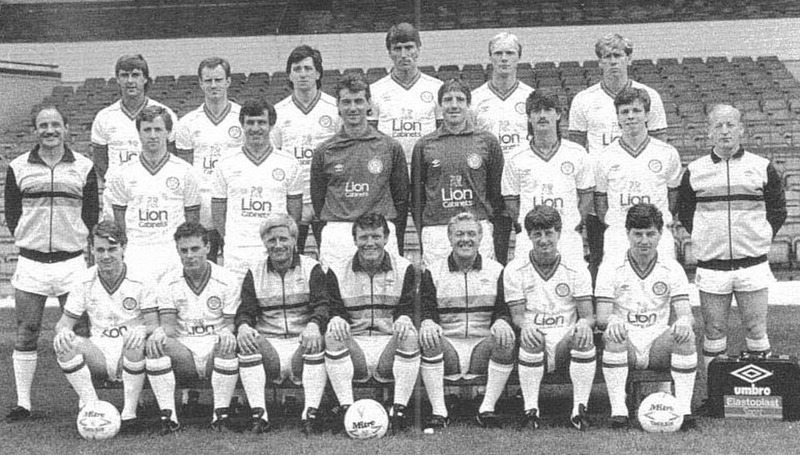 Back Row: Keith Mincher (Coach), Andy Watson, John Donnelly, Tony Brown, Neil Aspin, George McCluskey, Peter Gunby (Coach). Middle Row: Geoff Ladley (Physio), Scott Sellars, Mark Gavin, Tommy Wright, John Sheridan, David Harvey, Gary Hamson, Kevin Hird, Martin Dickinson, Gwyn Thomas, Barry Murphy (Coach). Middle Row: Keith Mincher (Coach), Peter Gunby (Coach), Peter Barnes, Andy Ritchie, John Donnelly, Andy Watson, David Harvey, John Sheridan, Barry Murphy (Coach), Geoff Ladley (Physio). Back Row: Keith Mincher (Coach), Nigel Thompson, Roger Eli, Philip Hughes, Peter Swan, Jimmy Taylor, Jack Roberts (Physio). 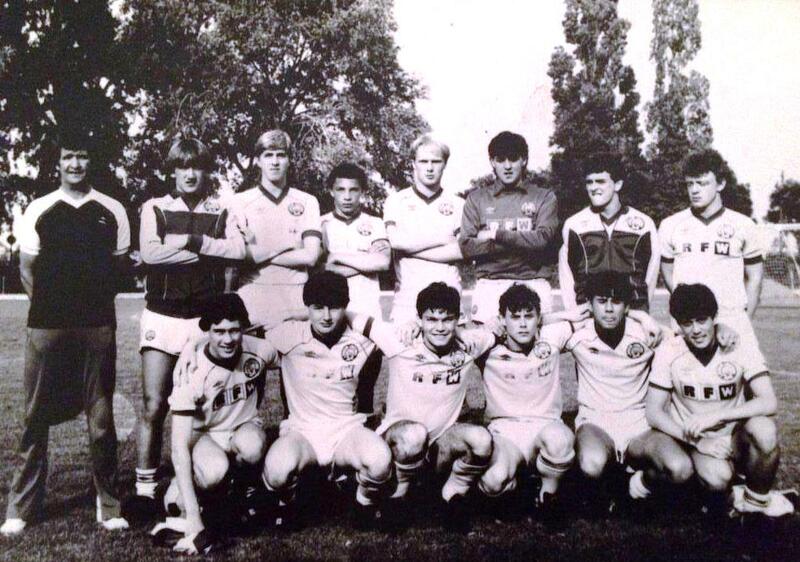 Front Row: Stephen O'Shaughnessy, Terry Phelan, Lyndon Simmonds, Tommy McDermott, Mark Russell, Dennis Irwin. 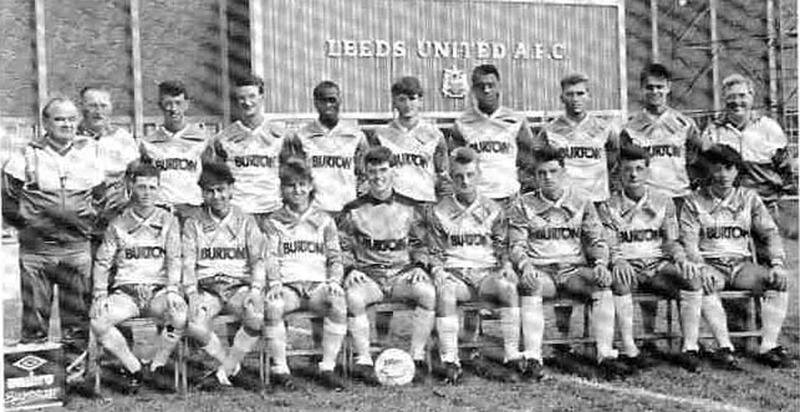 Back Row: Jack Roberts (Physio), Terry Phelan, Mark Russell, Lyndon Simmonds, Jeff Clarke, G. Williams, Keith Mincher (Coach) . Front Row: Stephen O'Shaughnessy, John Scales, Peter Swan, Nigel Thompson, Jimmy Taylor, Darren Sheridan. Back Row: Peter Swan, Roger Eli, Denis Irwin, Eddie Gray (Manager), Jim Taylor, Steve Livingstone, Nigel Thompson. Front Row: Mark Russell, Lyndon Simmonds, Terry Phelan, Ben Haworth. Back Row: John Stiles, John Scales, Andy Linighan, Steve O'Shaughnessy, Tony Brown, Peter Swan, Neil Aspin, Roger Eli, Peter Lorimer. Middle Row: Peter Gunby (Coach), Tony Fawthrop (Chief Scout), John Sheridan, Mark Gavin, Jeff Clarke, Dennis Irwin, Phil Hughes, Darrel Rose, David Harvey, Dave Mehew, John Donnelly, Mark Russell, Gary Hamson, George McCluskey, Keith Mincher (Coach), Geoff Ladley (Physio). 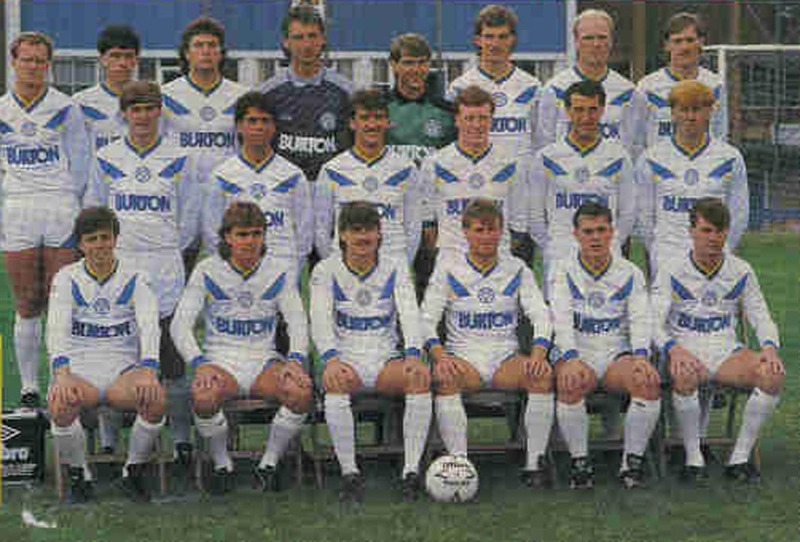 Front Row: Scott Sellars, Stevie Scholes, Andy Ritchie, Lyndon Simmonds, Tommy Wright, Eddie Gray (Manager), Jimmy Lumsden (Assistant Manager), Nigel Thompson, Frank Gray, Terry Phelan, Andy Watson, Darren Sheridan, Martin Dickinson. 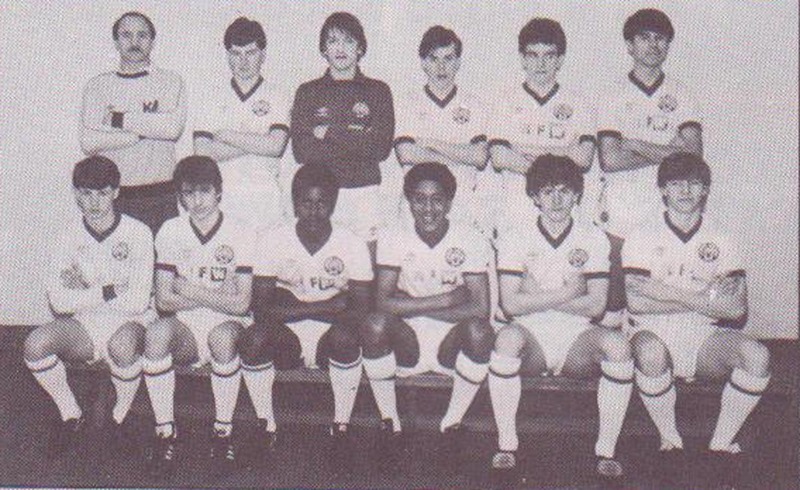 Middle Row: John Sheridan, Mark Gavin, Jeff Clarke, Dennis Irwin, Phil Hughes, Darrel Rose, David Harvey, Dave Mehew, John Donnelly, Mark Russell, Gary Hamson. 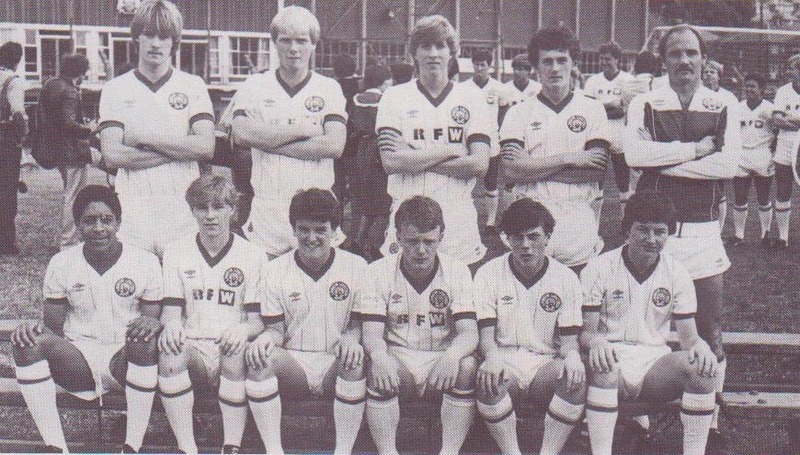 Front Row: Stevie Scholes, Andy Ritchie, Lyndon Simmonds, Tommy Wright, Eddie Gray (Manager), Jimmy Lumsden (Assistant Manager), Nigel Thompson, Frank Gray, Terry Phelan, Andy Watson, Darren Sheridan. 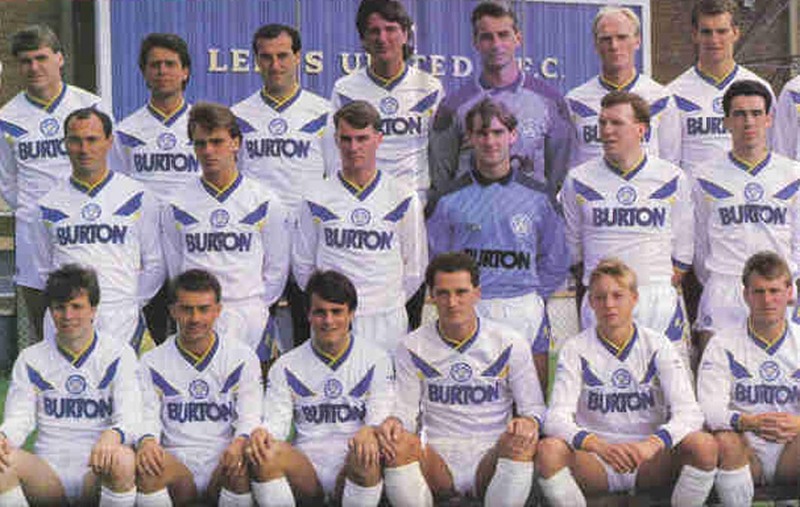 Back Row: Martin Dickinson, Neil Aspin, Andy Linighan, Tony Brown, George McCluskey, John Donnelly. Middle Row: Geoff Ladley (Physio), Keith Mincher (Coach), John Stiles, John Sheridan, David Harvey, Phil Hughes, Dennis Irwin, Peter Lorimer, Mark Gavin, Peter Gunby (Coach). Front Row: Andy Ritchie, Frank Gray, Scott Sellars, Eddie Gray (Manager), Jimmy Lumsden (Assistant Manager), Tommy Wright, Gary Hamson, Andy Watson. 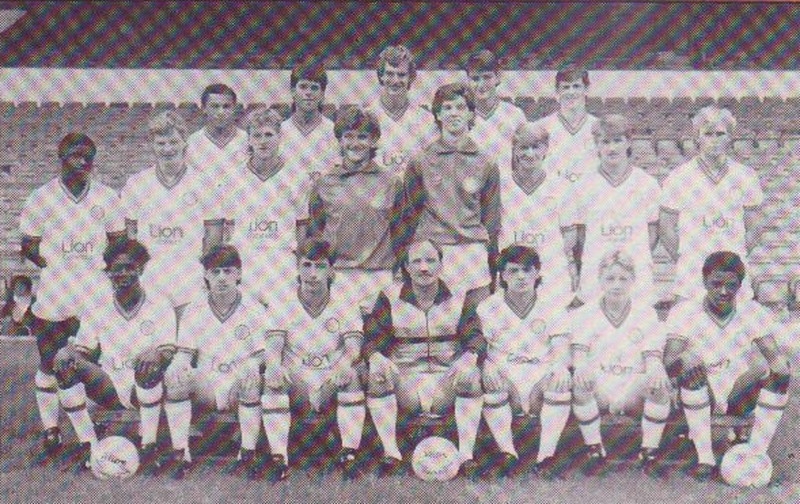 Back Row: Geoff Ladley (Physio), Stevie Scholes, Dave Mehew, Peter Swan, Darrel Rose, Steve O'Shaughnessy, Nigel Thompson, John Scales, Tony Fawthrop (Chief Scout). Front Row: Keith Mincher (Coach), Lyndon Simmonds, Jeff Clarke, Terry Phelan, Darren Sheridan, Mark Russell, Peter Gunby (Coach). 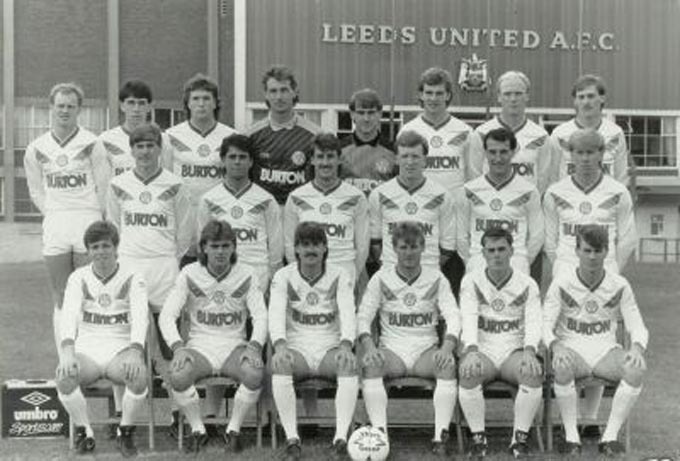 Back Row: Martin Dickinson, Roger Eli, Andy Ritchie, Nigel Thompson, George McCluskey, Steve O'Shaughnessy, Peter Swan, Andy Linighan, Lee Warren, Ian Baird, Neil Aspin, Peter Mumby, John Stiles. 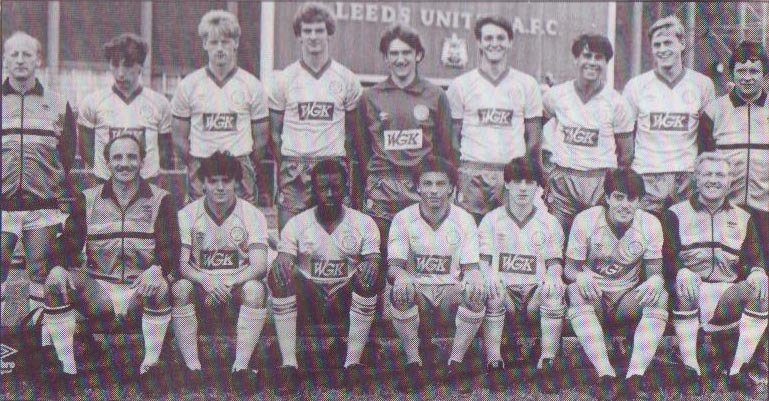 Middle Row: Jeff Clarke, Mark Fella, Gary Hamson, David Bentley, Peter Lorimer, Darrel Rose, Mervyn Day, David Mills, Trevor Swinburne, Ian Snodin, Andy Armitage, Stevie Scholes, Richard Annan. 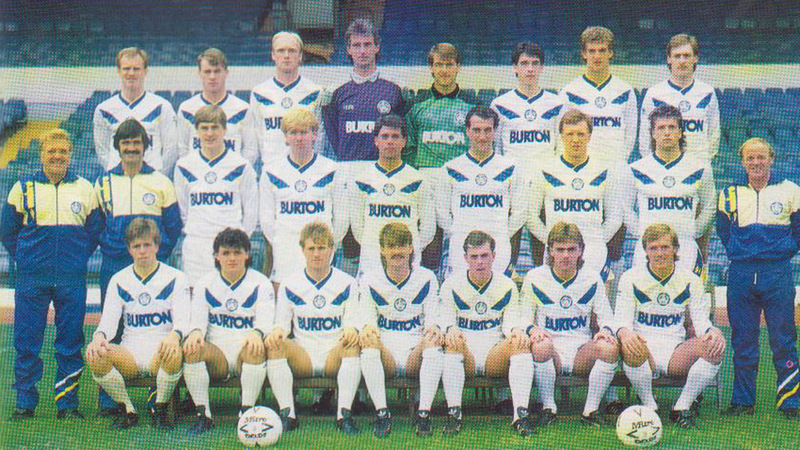 Front Row: Keith Mincher (Coach), John Sheridan, Terry Phelan, Tommy Wright, Vince Brockie, Dean Walling, Jimmy Lumsden (Assistant Manager), Eddie Gray (Manager), Peter Gunby (Coach), Darren Sheridan, Scott Sellars, David Batty, Dennis Irwin, Lyndon Simmonds, Geoff Ladley (Physio). Back Row: Martin Dickinson, Andy Ritchie, George McCluskey, Andy Linighan, Neil Aspin, Ian Baird. Middle Row: Keith Mincher (Coach), Gary Hamson, Peter Lorimer, Mervyn Day, Trevor Swinburne, Ian Snodin, John Stiles, Geoff Ladley (Physio). Front Row: John Sheridan, Tommy Wright, Jimmy Lumsden (Assistant Manager), Eddie Gray (Manager), Peter Gunby (Coach), Scott Sellars, Denis Irwin. Back Row: Martin Dickinson, Andy Ritchie, George McCluskey,Andy Linighan, Neil Aspin, Ian Baird. Middle Row: Keith Mincher (Youth Coach), Gary Hamson, Peter Lorimer, Mervyn Day, Trevor Swinburne, Ian Snodin, John Stiles, Geoff Ladley (Physio). Front Row: John Sheridan, Tommy Wright, Jimmy Lumsden (Assistant Manager), Eddie Gray (Manager), Peter Gunby (Coach), Scott Sellars, Dennis Irwin . 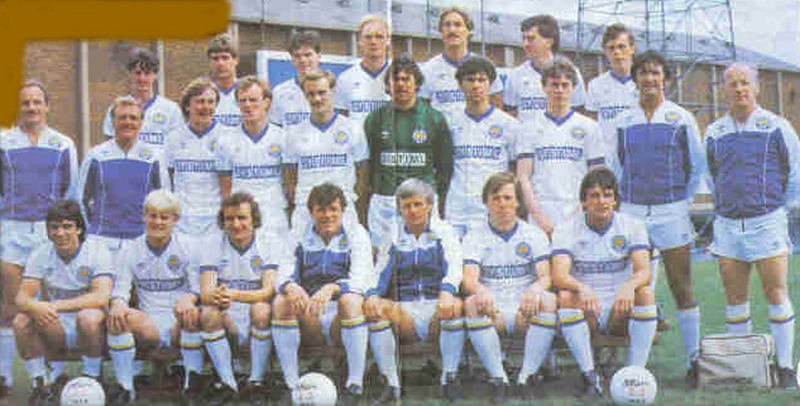 Back Row: George McCluskey, Andy Ritchie, Andy Linighan, Neil Aspin, Ian Baird, Martin Dickinson. 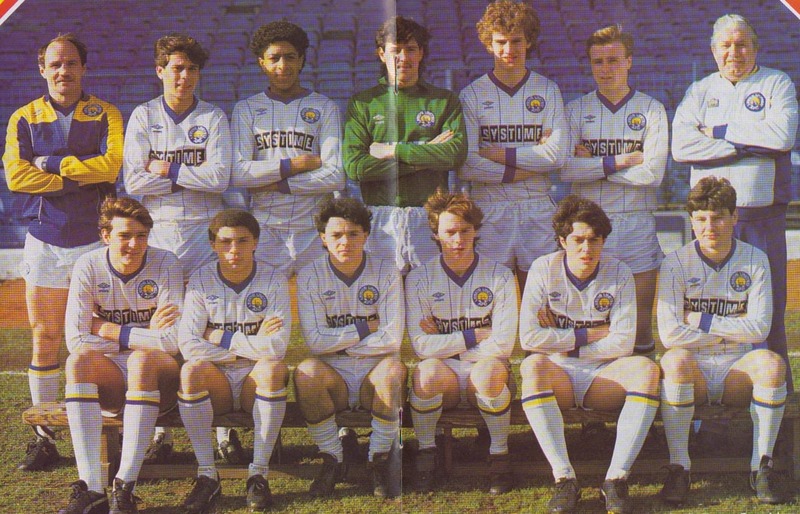 Back Row: Terry Phelan, Nigel Thompson, Peter Swan, Steve O'Shaughnessy, Andy Armitage. 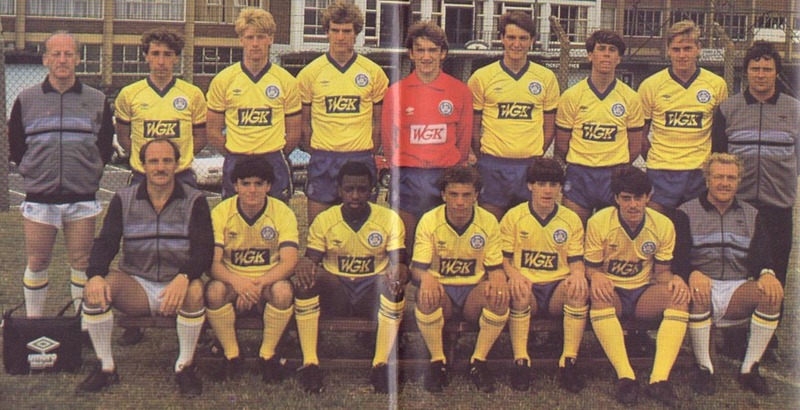 Middle Row: Richard Annan, David Bentley, Mark Fella, Darrel Rose, David Mills, Vince Brockie, Peter Mumby, Lee Warren. 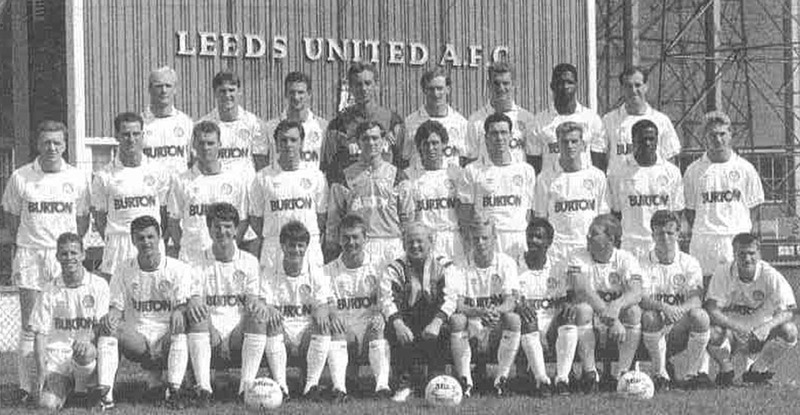 Front Row: Dean Walling, Tommy Wright, Stevie Scholes, Keith Mincher (Coach), Lyndon Simmonds, David Batty, Jeff Clarke. Back Row: Peter Swan, Ian Baird, Andy Linighan, Neil Aspin, Stephen O扴haughnessy, Roger Eli, Andy Ritchie, Martin Dickinson. Middle Row: Geoff Ladley (Physio), David Bentley (Assistant Manager), Nigel Thompson, Gary Hamson, Mervyn Day, Trevor Swinburne, Dennis Irwin, David Blakey (Chief Scout), Billy Bremner (Manager), Peter Gunby (Coach). Front Row: Peter Lorimer, John Sheridan, George McCluskey, Scott Sellars, Ian Snodin, Lyndon Simmonds, Terry Phelan, John Stiles. Middle Row: Nigel Thompson, Gary Hamson, Mervyn Day, Trevor Swinburne, Dennis Irwin, David Blakey (Chief Scout), Billy Bremner (Manager). 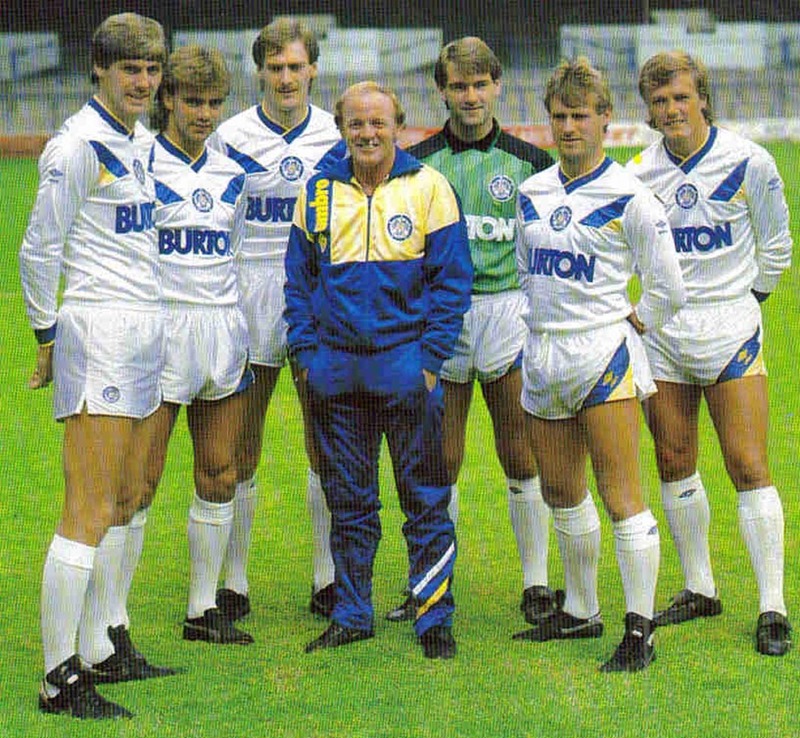 Jack Ashurst, John Buckley, Peter Haddock, Billy Bremner (Manager), Ronnie Sinclair, Russell Doig, Keith Edwards. 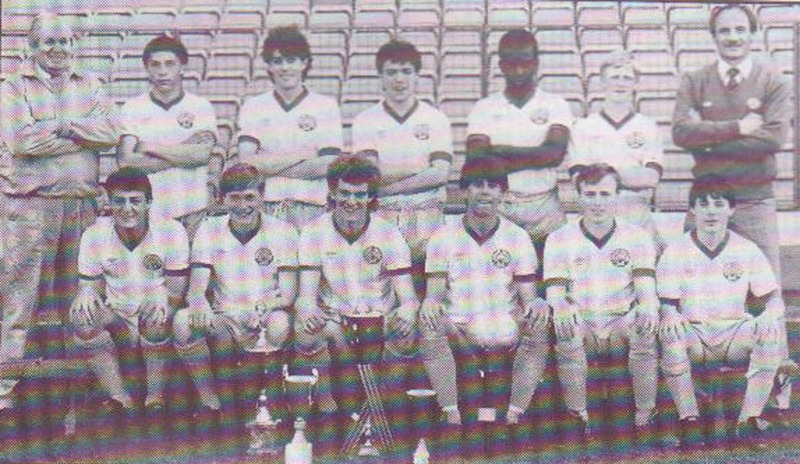 Back Row: Andy Ritchie, Neil Aspin, Ronnie Robinson, Mervyn Day, Ronnie Sinclair, Peter Swan, Peter Haddock, David Rennie. Middle Row: Geoff Ladley (Physio), David Bentley (Assistant Manager), Jack Ashurst, Bob Taylor, Brian Caswell, Brendan Ormsby, Ian Baird, Peter Gunby (Coach), Billy Bremner (Manager). Front Row: Nigel Thompson, John Stiles, John Sheridan, Ian Snodin, Tommy Wright, Russell Doig, John Buckley. Back Row: Jack Ashurst, Ian Baird, John Pearson, Mervyn Day, David Rennie, Peter Swan, Neil Aspin. Middle Row: Alan Sutton (Physio), Peter Gunby (Coach), Bobby McDonald, Peter Haddock, David Rennie, Ronnie Sinclair, Nigel Thompson, Brendan Ormsby, David Bentley (Assistant Manager), David Blakey (Chief Scout), Billy Bremner (Manager). Front Row: John Stiles, Andy Ritchie, Bob Taylor, Mickey Adams, Russell Doig, John Sheridan, Keith Edwards. 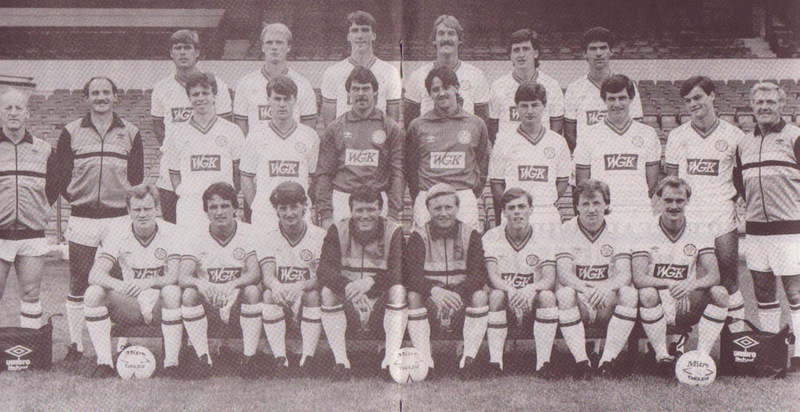 Back Row: Andy Ritchie, Bob Taylor, Ronnie Robinson, Mervyn Day, Ronnie Sinclair, Peter Swan, Neil Aspin, Peter Haddock. Middle Row: Jack Ashurst, Nigel Thompson, Brian Caswell, Brendan Ormsby, David Rennie, Ian Baird. 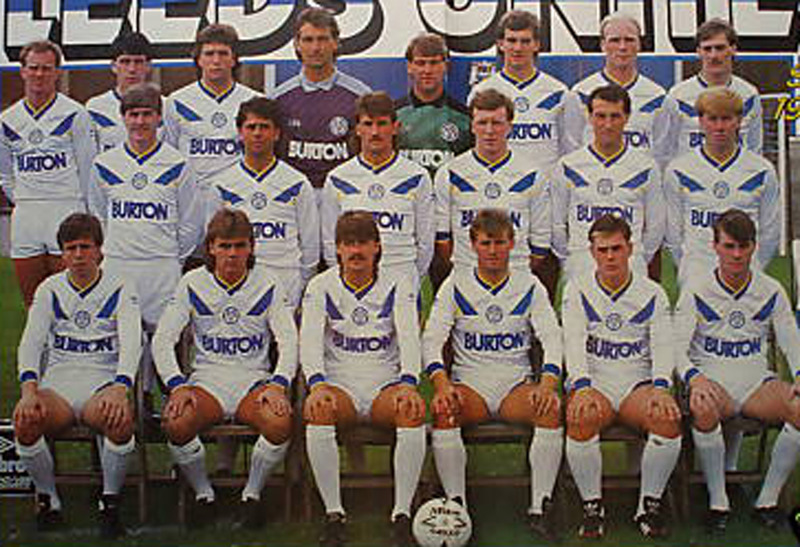 Front Row: John Stiles, John Buckley, Ian Snodin, Russell Doig, Tommy Wright, John Sheridan. 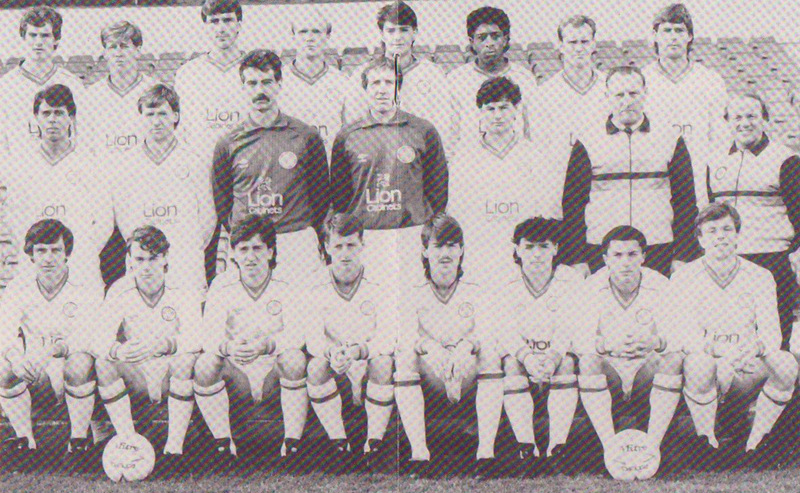 Back Row: Andy Ritchie, John Sheridan, Neil Aspin, Mervyn Day, Ronnie Sinclair, Bob Taylor, Peter Swan, Peter Haddock. Middle Row: Peter Gunby (Coach), David Bentley (Assistant Manager), Jack Ashurst, Ian Baird, Nigel Thompson, David Rennie, Brendan Ormsby, Ronnie Robinson. Front Row: John Stiles, Lyndon Simmonds, Russell Doig, Ian Snodin, Tommy Wright, John Buckley, Keith Edwards. 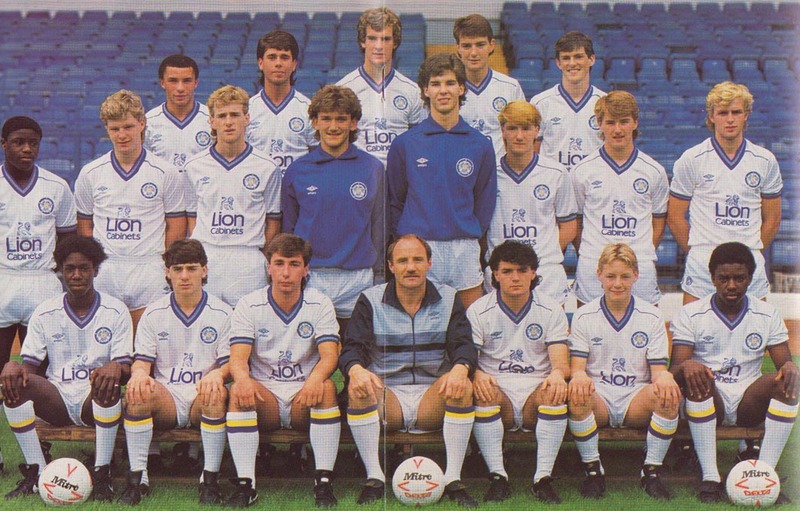 Back Row: Peter Gunby (Coach), Andy Armitage, Mark Phelan, Peter Mumby, Simon Grayson, David Mills, Simon Carlisle, Robert Ainley, Dean Walling, David Blakey (Chief Scout). Front Row: Kevin Noteman, Lee Warren, Gary Speed, David Bentley, David Batty, Vince Brockie, Nigel Smith, Richard Annan, Peter Maguire. Back Row: Jack Ashurst, Nigel Thompson, David Rennie, John Pearson, Mervyn Day, Neil Aspin, Peter Swan, Peter Haddock. 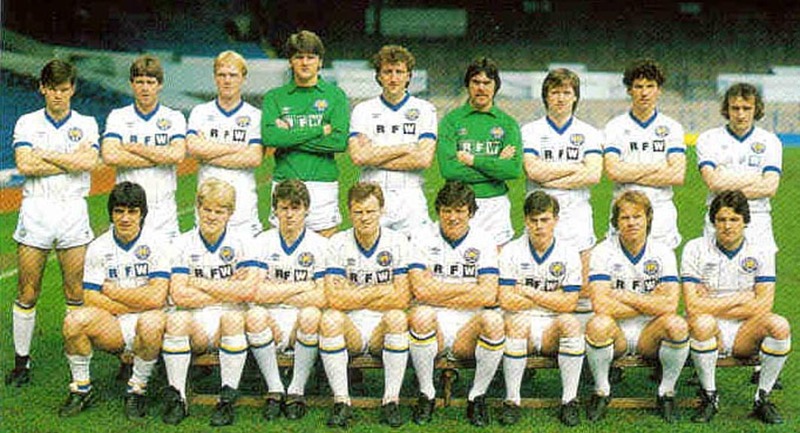 Middle Row: Bobby McDonald, John Buckley, John Sheridan, Ronnie Sinclair, Brendan Ormsby, Bob Taylor, Gary Williams. 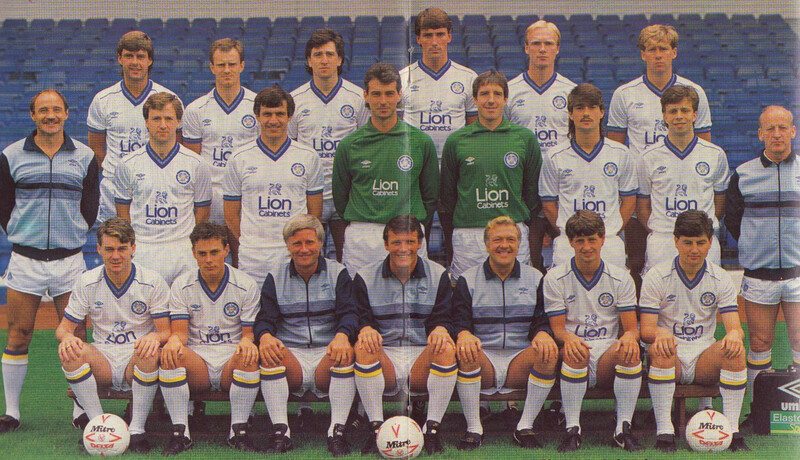 Front Row: John Stiles, Glynn Snodin, Micky Adams, Mark Aizlewood, David Batty, Russell Doig, Keith Edwards. Back Row: Jack Ashurst, Nigel Thompson, David Rennie, John Pearson, Mervyn Day, Neil Aspin, Peter Swan. Middle Row: Bobby McDonald, John Buckley, John Sheridan, Ronnie Sinclair, Brendan Ormsby, Bob Taylor. 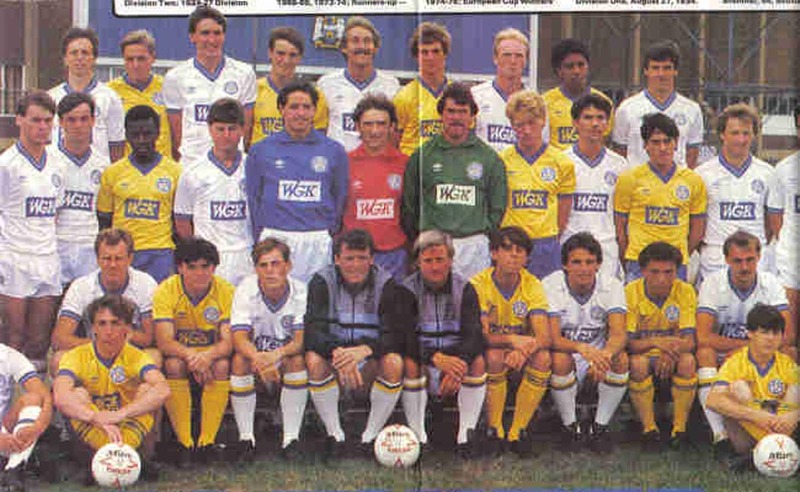 Front Row: John Stiles, Glynn Snodin, Micky Adams, Mark Aizlewood, David Batty, Russell Doig. Back Row: Jack Ashurst, David Rennie, John Pearson, Mervyn Day, Neil Aspin, Peter Swan, Peter Haddock. Middle Row: David Bentley (Assistant Manager), Nigel Thompson, Bobby McDonald, John Buckley, John Sheridan, Ronnie Sinclair, Brendan Ormsby, Bob Taylor, Gary Williams, Davis Blakey (Chief Scout), Billy Bremner (Manager). 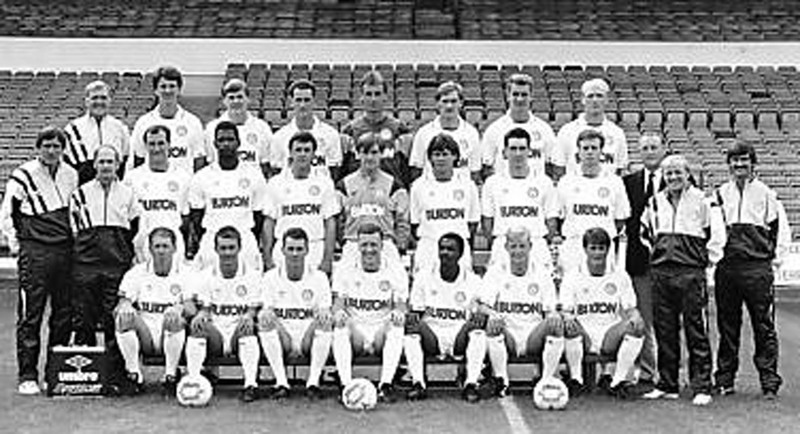 Front Row: Alan Sutton (Physio), John Stiles, Glynn Snodin, Micky Adams, Mark Aizlewood, David Batty, Russell Doig, Keith Edwards, Peter Gunby (Coach). Middle Row: Nigel Thompson, Bobby McDonald, John Buckley, John Sheridan, Ronnie Sinclair, Brendan Ormsby, Bob Taylor, Gary Williams. Back Row: Alan McIvor (Physio), David Blakey (Chief Scout), Mike Connors, Simon Grayson, Kevin Noteman, Sean Bennett, Grenville Shorte, Peter Maguire, Jason Longstaff, Peter Gunby (Coach). 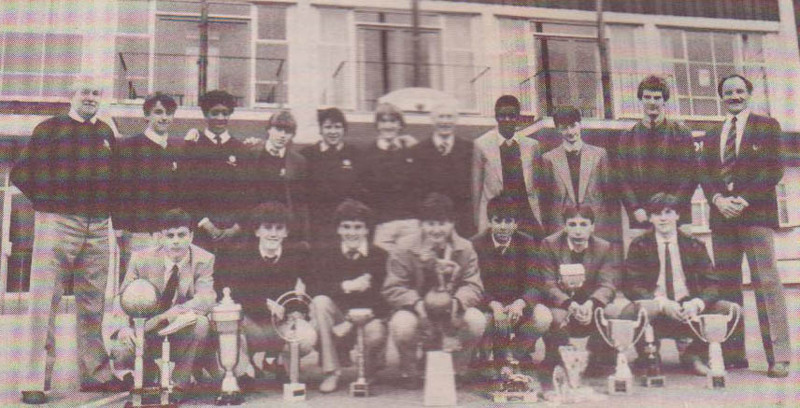 Front Row: Nigel Smith, Jeremy Smith, Darryle Franklin, Neil Edwards, Bob Ainley, Gary Speed, Darren Edwards, Tino Meli. Back Row: Peter Gunby (Coach), John Pearson, Jack Ashurst, Mark Aizlewood, Mervyn Day, Peter Haddock, Peter Swan, Neil Aspin. Middle Row: Norman Hunter (Coach), Alan Sutton (Physio), David Rennie, Noel Blake, Bobby Davison, Ronnie Sinclair, Gary Williams, Bob Taylor, John Stiles, Dave Blakey (Chief Scout), Billy Bremner (Manager), David Bentley (Assistant Manager). 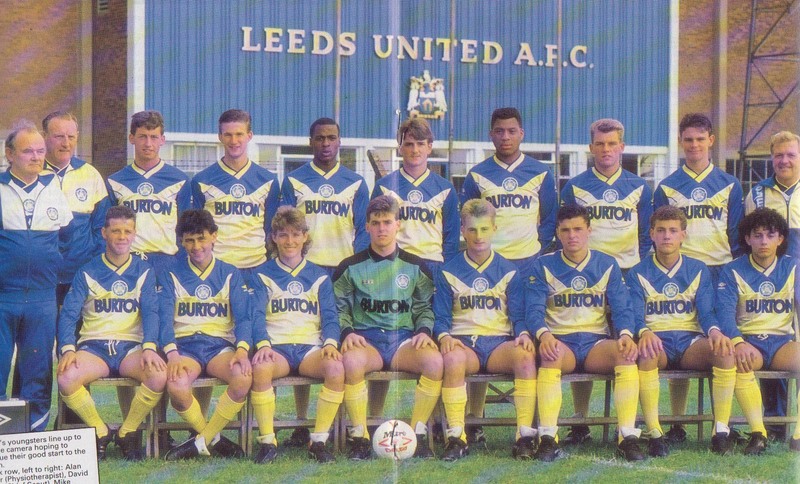 Front Row: Ian Baird, Glynn Snodin, John Sheridan, Brendan Ormsby, Vince Hilaire, David Batty, Micky Adams. 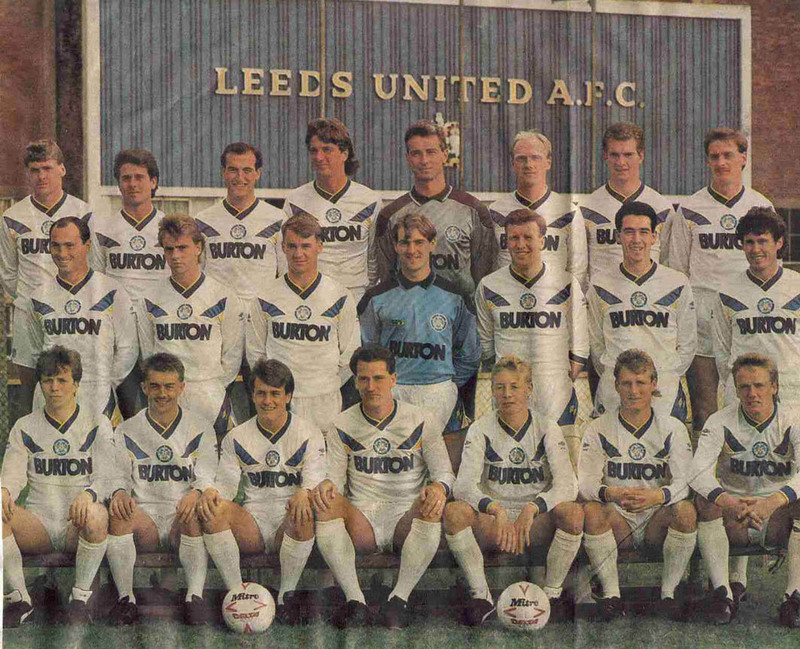 Back Row: Neil Aspin, Jack Ashurst, Simon Grayson, Mervyn Day, Peter Haddock, Peter Swan, Noel Blake, David Rennie. 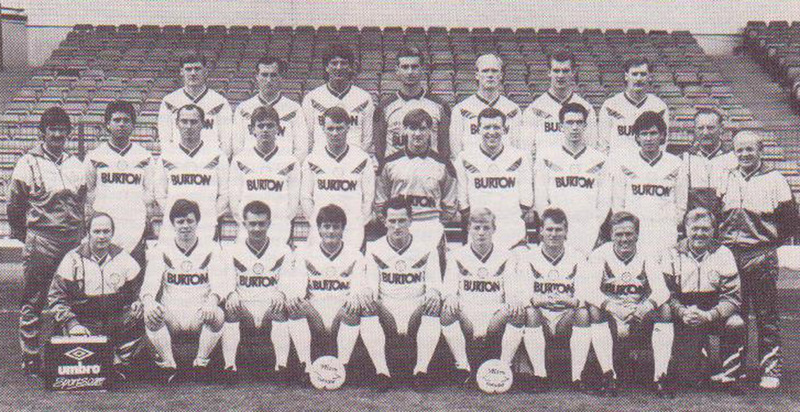 Middle Row: Peter Gunby (Coach), Alan Sutton (Physio), Brendan Ormsby, Mark Aizlewood, John Sheridan, Bobby Davison, Ronnie Sinclair, Gary Williams, Bob Taylor, Peter Maguire, Kevin Noteman, Peter Mumby, Norman Hunter (Coach), David Bentley (Assistant Manager). 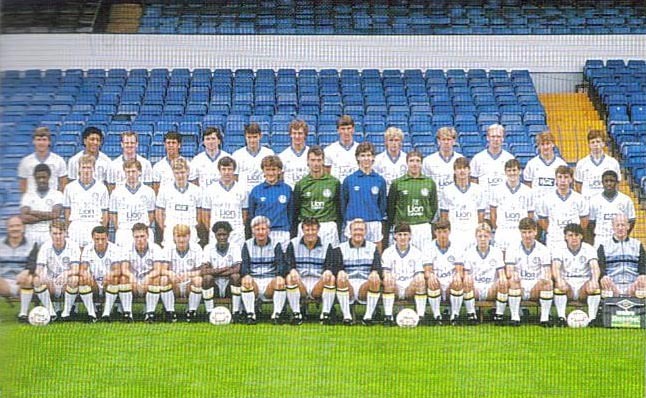 Front Row: Nigel Smith, Gary Speed, John Pearson, Micky Adams, Glynn Snodin, Billy Bremner (Manager), David Batty, Vince Hilaire, Ian Baird, John Stiles, Vince Brockie. Middle Row: Brendan Ormsby, Mark Aizlewood, John Sheridan, Bobby Davison, Ronnie Sinclair, Gary Williams, Bob Taylor, Peter Maguire, Kevin Noteman, Peter Mumby. Back Row: Peter Cooper (Coach), Steven Mulrain, Jonathan Taylor, Andy Crosby, Simon Taylor, Damian Henderson, Simon Brooker, Mark Preston, Alec Nesovic, Terry Rhodes (Manager). Front Row: Richard Harrison, Michael Norton, Gareth Stoker, Christopher Gott, Darren Hayward. Back Row: Alan McIvor (Physio), Wayne Jackson, Justin Sumpter, Michael Sloane, Simon Old, Neil Edwards, Jason Longstaff, Scott Blunt, Grenville Shorte, Peter Gunby (Coach). Front Row: Scott Rogan, Darren Edmonds, Darryl Franklin, Michael Knop, Jeremy Smith, Lee Stephens, Russell Wigley, Tony Smart, Steve Nicholson. 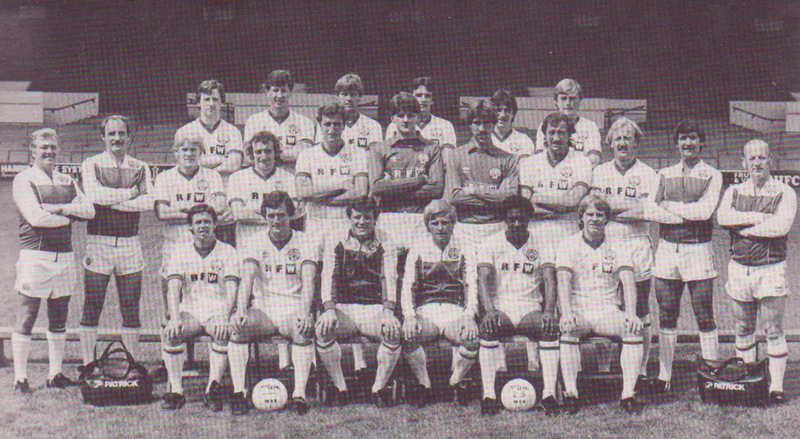 Billy Bremner (Manager), Eddie Gray (Manager), Micky Adams , Mark Aizlewood , Jack Ashurst , Neil Aspin , Ian Baird , Peter Barnes , David Batty , Noel Blake , Vince Brockie , Tony Brown , John Buckley , Kenny Burns , Aidan Butterworth , Brian Caswell , Trevor Cherry , Terry Connor , Bobby Davison , Mervyn Day , Ken De Mange , Martin Dickinson , Russell Doig , John Donnelly , Keith Edwards , Roger Eli , Mark Fella , Brian Flynn , Mark Gavin , Arthur Graham , Eddie Gray , Frank Gray , Simon Grayson , Peter Haddock , Gary Hamson , David Harle , Paul Hart , David Harvey , Vince Hilaire , Kevin Hird , Phil Hughes , Denis Irwin , Andy Linighan , Peter Lorimer , John Lukic , Peter Maguire , George McCluskey , Bobby McDonald , John McGoldrick , John McGregor , Neil McNab , Jim Melrose , Peter Mumby , Kevin Noteman , Brendan Ormsby , Derek Parlane , John Pearson , Terry Phelan , David Rennie , Andy Ritchie , Ronnie Robinson , Scott Sellars , John Sheridan , Lyndon Simmonds , Ronnie Sinclair , Glynn Snodin , Ian Snodin , John Stiles , Peter Swan , Trevor Swinburne , Bob Taylor , Gwyn Thomas , Nigel Thompson , Andy Watson , David Whyte , Gary Williams , Frank Worthington , Tommy Wright .